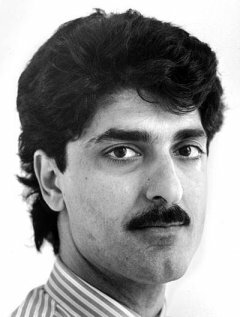 On this date in 1990, Iranian-born British journalist Farzad Bazoft was hanged at Baghdad’s Abu Ghraib prison as an Israeli spy. The 31-year-old Observer freelancer was in Iraq to cover post-war reconstruction when he caught wind of an explosion at a military factory and set off to investigate. This sniffing about Iraq’s weapons programs was not the sort of journalism Iraqi dictator (and future fellow gallows-bird) Saddam Hussein had in mind when his government invited Bazoft. Bazoft was nabbed (along with the British nurse who had accompanied him, Daphne Parish) with photographs and soil samples from the sensitive compound. Held incommunicado for six weeks, Bazoft was trundled onto state TV on November 1, 1989 to confess to spying for Israel (video of that confession is available from this BBC story). He was convicted of espionage in a one-day, in camera trial on March 10 and hanged five days later. A few months after Bazoft’s hanging, when Saddam Hussein invaded Kuwait and thereby transmogrified from a source of moderation in the region into the new Hitler, Bazoft’s execution naturally went onto the bill of attainder against Baghdad. Like other Iraqi human rights abuses that became much bigger news only after Saddam became an official enemy, however, Bazoft’s fate exercised some of his defenders more in retrospect than it did in the moment. Indeed, some British MPs openly endorsed the execution and some Fleet Street contrarians bucked the worldwide humanitarian appeal by publishing embarrassing information about Bazoft (he’d been to jail in Britain) leaked by British intelligence. * Bazoft is still honored by his former employer and his former colleagues, as well he might be. But the Observer‘s claim that it “proved” Bazoft’s innocence has to be taken with a grain of salt: apart from the de rigueur smoke-and-mirrors, plausible-deniability skein of the espionage game, the interrogator’s exculpatory statement was made by an obviously self-interested party to representatives of a power then occupying Iraq. Although it’s a minority position subject to hot dispute, some people do believe that Bazoft was indeed a Mossad agent. Gordon Thomas, in Gideon’s Spies: The Secret History of the Mossad makes exactly that case. Videotaped confession aside, Bazoft reputedly denied the espionage charge at the gallows.